The 1920s were a unique period in the development of American music, and as we reach the end of that decade, it’s worth taking a look back at its significance. More than any other decade, the ‘20s stand apart musically, and it is important that we not forget this music: not just because of its historical significance, but because so much of it is amazing and unlike anything that would come after. This was a decade where every artist was a pioneer, every record a first. While modern audiences often don’t appreciate the richness of this period, the ‘20s rival any decade since in terms of the diversity of music captured on record. And although the musical landscape was rapidly evolving thanks to technology and social changes, the recordings of this period give us a window at least into the music that had been passed down but never recorded in the previous decades and centuries. For many rural artists of the 1920s, making records was a curiosity, a way to earn a few extra dollars, but not a primary source of income. Few artists achieved fame on a national level, and in many cases record sales were limited to within a few miles of the artist’s home town. Many rural artists – African American and white alike – never found success in their own times, and lived their entire lives in relative poverty. Some recorded a few sides and were never heard from again: we have no biographical information, no surviving photographs, just a handful of scratchy records. The fact that some of these records were made at all is in many ways a miracle, and one can only speculate about the equally talented artists that never got the chance to leave such a legacy behind. As the 1930s began under the shadow of the Great Depression, money for buying records dried up and with it recording opportunities for all but a handful of the artists of the ‘20s. Many brilliant careers stalled as poor rural artists were forgotten, and put aside their banjos and guitars to take jobs as janitors and field hands. Some of those artists would be rediscovered in their twilight years decades later, and would finally find the fame they so deserved, playing before thousands of appreciative fans at folk festivals. But for many more, it was too late. A shockingly high percentage of these artists died young, done in by a combination of fast living, poor medicine and hard times. They were buried, some in unmarked graves, and quickly forgotten. The 1930s would in many ways be even harder. At the height of the Great Depression, many record companies went out of business, and there were almost no new records being made. And yet, the well never went completely dry. Jazz would continue to capture audiences’ attention, thanks to the fresh new sound of big band swing, and for those jazz artists able to make the transition, there were many opportunities. 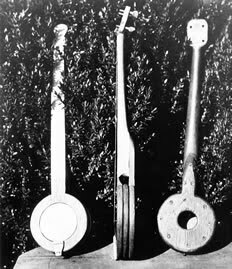 Blues, country and other “folk” styles also managed to hold on, and they too innovated new sounds that would earn a place in history. What follows are some of the undeniable classics of this new decade, as well as a few all-but-forgotten gems that deserve to be rediscovered. Start here, but by all means explore the music of the ‘30s on your own as well… and enjoy!